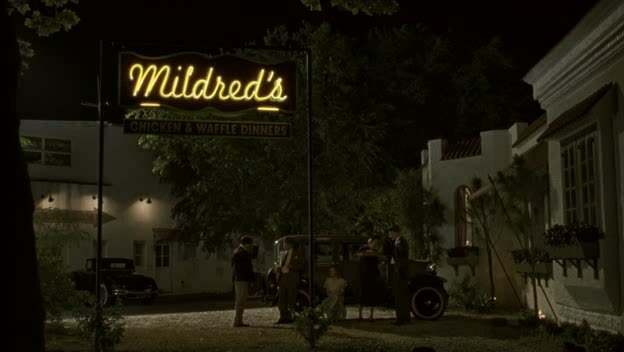 James M. Cain liked to incorporate language he heard on the street, but "hoo-ha" is not in his novel Mildred Pierce (1941). So it was an addition to the screenplay by writer-director Todd Haynes. The Merriam Webster Dictionary gives the "first known use" as 1931 but has no citation for that source. The word derives from the Yiddish hu-ha, meaning a commotion, uproar, hullabaloo, an argument between a group of people or an exclamation of surprise. I'd never given much thought to the word prior to Kurtzman's use in the first issue of Mad. He introduced several Yiddishisms in Mad, and he used "Hoohah" as a shout (as in "Melvin of the Apes"). But when it was first used on page one of Mad #1, it seemed to indicate the traditional meanings (and also Kurtzman's triumphant yell to announce the debut of Mad). 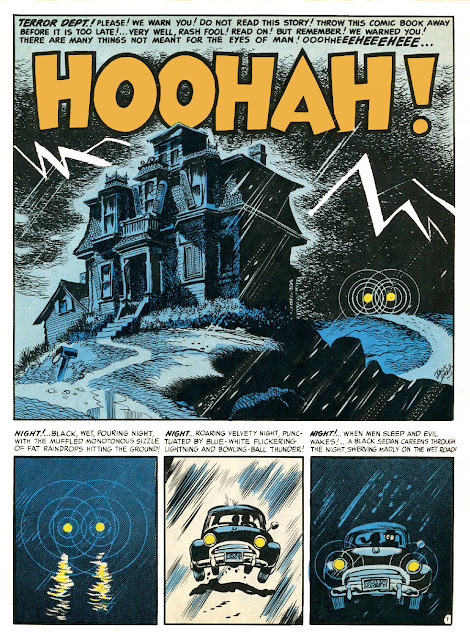 Kurtzman had previously created a straight haunted house tale, "House of Horror", for the first 1950 issue of The Haunt of Fear, so he was actually satirizing himself with "Hoohah!" I had heard "hoo-ha" used as a kid in my neighborhood in Newark before I saw it in Mad. In Mad it is used as an expletive. But I knew it to mean rigamarole or nonsense before that. My Newark neighborhood (I lived at 721 Highland Ave.) was Jewish, Italian and black. Sometimes words intermixed. There are two specific words of my youth, which I haven't heard outside of that block in Newark. One is "Schneichick", which as a noun means a person who does a half-assed job at something, and as a verb means the same... i.e. "Don't be a schneichick! You're doing a scheneichick job vaccuming that rug!" The other word is pronounced "bootza" maybe spelled "butzah", and it means to flick something with your index finger. The origin of Schneichick I know. It's a Yiddish thing... or a Russian thing... a kid in 19th-century Russia in a small village was named Schnei (a common name of the era, which means "Sainai"). Chic is a diminutive. So it means Schnei-boy. Anyway, Schnei's mother saw it was going to rain... so she told Schnei to close the windows... and he then closed the windows of every house in the village. The other Schneichick tale is that Schneichick's mother bought him a raincoat, which he then wore all the time... even when it wasn't raining. "Butzah" might be an Italian word. There is no word in English with its precise meaning. But then again, it might be a Russian or Yiddish word. I don't know. I haven't heard anyone (outside of my relatives) use it since l947 in Newark on that block. Although my relatives continue to use that word. Hoo-ha which is, in their usage, synonomous with Bru-ha-ha. I think words like "smek" and "furshlugginer" in Mad were humor at the time in that they were words used by old people. Yet in Mad they were used in a hip context, which made them unexpected and therefore humorous in that context. Kind of different from say Lenny Bruce's use of such Yiddish words, which were not words that had become arcane at the time he used them. Words like schmuck and schvartza which never left the lexicon. Actually, I never heard "furshlugginer" until I saw it in Mad. The word that means "crazy" would actually be "meshuganah". But where Kurtzman grew up maybe they had a different dialect on his block. Kurtzman's ''Ikey and Mikey'' sidewalk comic I would think is based upon a risque song that was sung at the time by kids. Benny Bell did a cleaned-up, recorded version. I have kids singing a bit of the original version in the strip I did with Ed Piskor called "Dead Rat" which is on line somewhere. By the way, Benny Bell's grandson wrote a nifty biography of Benny Bell. I got a copy a few years back from Amazon. Bell did slightly risque comedy records in the 1940s and 1950s. He is famous for the old song "Shaving Cream" which Dr. Demento brought out of obscurity in the late 1970s. Most of Bell's stuff is based on anonymous neighborhood dirty songs. I still remember most of the original words to these. Most are on the order of "Sweet Violets". Not the Dinah Shore version, though. You know, because I spoke Newarkese before I learned to read, I still don't know the correct pronounciation of a lot of words. I tend to use silent "r"s, and I still think that the Mayor of NYC was named LaGuadia. But now consider this passage from T.S. Eliot, which is curiously similar to the story elements in Kurtzman's "Hoohah!" Eliot's "hoo-ha's" are a mix of fear, guilt and terror. for you know the hangman's waiting for you. For the full "Hoohah! ", surf over to Jeff Overturf. Madisms are always highly entertaining, as is the history behind them. I particularly enjoyed the passage out of T.S. Eliot’s Sweeney Agonistes. Kurtzman must have loved it. As always, thank you for sharing. is the editor of Against the Grain: Mad Artist Wallace Wood (2003), reviewed by Paul Gravett.